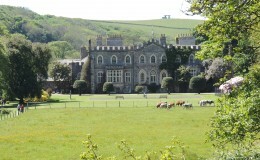 Hartland Abbey with its beautiful gardens and grounds welcomes visitors from the end of March until October. 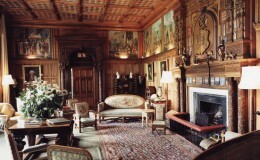 It is the cherished home of the Stucley family with treasures and memorabilia collected over many generations. The beautiful 18thC Walled and Woodland gardens, the walks and the parkland provide visitors with extensive grounds through which to wander and enjoy the stunning valley leading down to the rugged Atlantic cove and cottage at Blackpool Mill, the location for many notable films. The BBC adaptation by Andrew Davies of Jane Austen’s ‘Sense and Sensibility’, German ZDF’s production of the Rosamund Pilcher novel, ‘The Shell Seekers’ ,(Die Muschelsucher), the major BBC drama production, John Le Carre’s ‘The Night Manager’ starring Hugh Laurie, Tom Hiddleston and Olivia Colman, ‘The Guernsey Literary and Potato Peel Pie Society‘(2017) with Lily James and BBC’s ‘Gold Digger’ for 2019 have all been filmed here recently. 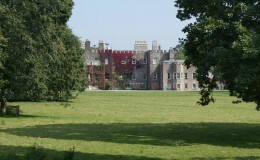 BBC Antiques Roadshow was filmed here in 2012. Coach parties are very welcome. If you would like to download our 2019 leaflet please click here . Built in the 12th Century, Hartland Abbey survived as a monastery longer than any other in the country. In 1539 Henry VIII gifted the Abbey to the Keeper of his Wine Cellar and today the house still remains in the family. Hartland Abbey is probably the most historically important ancestral home in North Devon containing much of national interest, including architecture and decoration from the Mediaeval, Queen Anne, Georgian, Regency and Victorian periods, paintings, furniture, Chinese artefacts and porcelain collected over many generations. Delicious coffee, light lunches, homemade cakes and cream teas are served from 11.00 in The Old Kitchens Tea Room. Dogs are welcome on leads in the gardens and walks. Exciting events for 2019 start with Daffodils and Spring Flowers on Sunday 17th March. The house and gardens open for the season on Mothering Sunday 31st March. Bluebell Sunday is on 14th April, Easter Fun and Bluebells on Easter Day 21st and Easter Monday 22nd April. A great variety of outdoor theatre productions are on the summer menu (see Events page)! Our exhibitions, ‘William Stukeley – Saviour of Stonehenge’, ‘Filming on the Hartland Abbey Estate since 1934’ and ‘History of the Hartland Abbey Estate’ continue to entertain visitors.